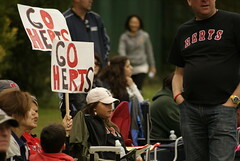 The Herts baseball club was an integral part of the 2011 British baseball season. The curtains were raised and lowered at the green, green grass of Grovehill — from the Herts Spring League in March to the moment when the Southern Nationals were proclaimed National Baseball League Champions in September. And the Herts teams each had a story to tell. Sadly, none of the three adult teams was able to put together a winning record. But whichever way you look at it, the future is bright. Let’s start with the National League, where the Falcons were spending their third consecutive season. It was always going to be challenging, as the Nationals who went on to win the NBL title did so with the help of a clutch of 2010 Herts players. Despite the sudden departures, the 2011 Falcons never lost their enthusiasm for the game. With Lee Manning now at the helm, that was never likely. The team began the year against the Southampton Mustangs, who went on to have a strong season, and they nearly came away with a split. In fact, it was part of a 6-game losing streak to open the season and that element of “nearly” haunted the Falcons season a little. Their final record was 4-19, but that does not reveal the extra-innings defeats by Essex and Bracknell, or the close final moments of contests against Lakenheath and Richmond. Twice the Falcons took a lead late into the game against the eventual champion Nationals, only to be overhauled. There were high spots in their performances. 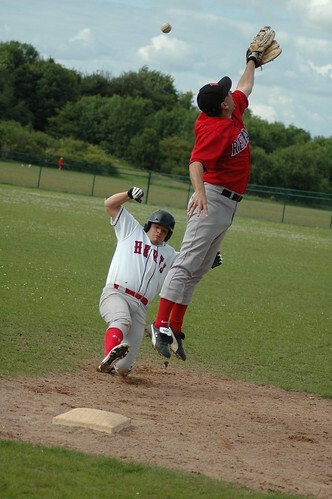 Shortstop Troy Linton made what must rank as one of the plays of the season for the entire League, making a spectacular diving catch against the Lakenheath Diamondbacks. 15 year old Liam Green continued his emergence on the NBL scene, maturing steadily and providing just the first of many mentions here of the Herts youth pedigree. There was also a rediscovery of fun and joy among the Falcons – Louis Hare, who had moved up from the 2010 Eagles, found himself enjoying his baseball more than ever. Manning can take a great deal of credit for that, and while the work of turning the team around and challenging for a title will not happen overnight, the work has already started for players, coaches and fans. The Herts Hawks had a new twin-headed management team, as Andy Cornish joined Greg Bochan at the helm. Slugger, catcher and all around gentleman Cornish said that throughout the year the Hawks developed, learned and bonded and from that they built a team and started to win. Like the Falcons, they also lost their first six league games, some in lop-sided games and others in close contests. A titanic double-header against the Essex Redbacks in June suggested that the gods were against the Hawks — they narrowly lost both games, despite a superbly impressive effort. But as June turned to July they got the winning habit and took games from Richmond and Brentwood. The biggest win was over Thames Valley in August, a 16-15 walkoff after a comeback. The Herts Raptors had very much a season of two halves. In the Spring, it had been hoped that last year’s developing corps of starting pitchers could really blossom in 2011. But Phil Gover and Bryan Drummond were largely kept away by external commitments and injury, while Jim Arnott had moved up to the Hawks. That left the coach Ken Pike shouldering the vast majority of the pitching duties. He gave it 110% as always, but was a tough ask whilst also trying to drive the offense and the organisation of a band of genuine rookies. The Raptors were humbled in their early games — which were, in their defence, against the powerful Southampton Mustangs and the eventual national champions of Single-A, the Cambridge Royals. But the character of the season changed slowly, at first imperceptibly, with the addition of further pieces of the jigsaw. John Kjorstad and Theo Scheepers came aboard, both feeling their way back into the game of baseball after a long layoff. And they would help to turn the Raptors season around, especially once Scheepers was able to share the load of the pitching duties. From the mound, he was consistent and tough,vital qualities in this league. The talented graduates of the Little League — including Zach Longboy and Jose Morillo — were also maturing and getting used to the challenges of the adult game. By the end of the year, they were formidable, and Pike said that opposing teams “gawped” when they found out how young they actually were. If there was a pivotal point, Coach Ken identified it as being the Croydon Tournament. Plenty of Raptors players took part and they relaxed and had fun, and experienced a win for the first time in 2011 . The last of the key recruits played his first game there too, Glen Downer. A double header later in July against the Old Timers showed how much had changed. In the first game, it was even for several innings before the Old Timers made their experience tell, but the second game ended with a 16-15 walkoff win. And then, finally, it happened. The Raptors won. On a baking hot day in Tonbridge they blew away the Bobcats, with their patience at the plate being matched by their power. Pike took the win, with Morillo closing it out. Downer’s big bat in particular, showed what a weapon it could be. There was another heartbreaking 16-15 loss at Braintree, but the season ended with three wins from the last four. Ken Pike hailed the incredible effort from the team: “Some people describe baseball seasons as roller coasters, but we started at the very bottom and just went up and up and up, which is fantastic for a season but crap for a rollercoaster.” And he noted that Longboy, Morillo and Senna Ashida are the sort of players showing that the future is bright. And that takes us to the best performers on the Herts club. The Little League once again went from strength to strength, with a competitive regular season building to another national final for the U-14 All Stars. In fact, the club entered two All Star teams in the postseason, compared to one in 2010. 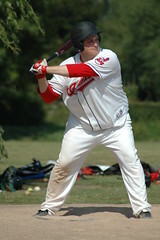 This is the first time in Herts Baseball history that the club had entered a team in the Under-17 league. The team reached the playoffs and gave a spirited performance against the Essex RedBacks. The lead kept changing hands inning-after-inning. Herts had a slender 1-run lead going into the bottom of the final inning but sadly couldn’t hold on to it losing 11-10 at the end. Despite the loss, the Herts U17 All Stars should be very proud of a fantastic first ever season going up into this age group. A check of the average age of all of the U17 teams which reached the playoff shows that many of the players among their opponents will be over the age limit next year, while most of Herts’ players have 2 or even 3 years still to play, and they have the opportunity and talent to shift the balance of power.